Tomorrow’s election could tip the balance of power in one Utah county. It’s the first general election since a federal judge ordered some area districts redrawn. The election highlights tensions between Native Americans and white residents in the county—and its result could give Navajos there more clout. Navajos make a slim majority in San Juan County, Utah, near the Utah-Arizona border. The county includes parts of the Navajo Nation, where people face huge differences in health, education, and economics. About 40% of the homes lack running water. Many lack electricity too. A judge ruled the county’s districts minimized the voices of its Navajo residents. San Juan County Navajos also face challenges getting to the ballot box. They went to court to settle obstacles like lack of traditional street addresses, unreliable mail service, and language barriers. 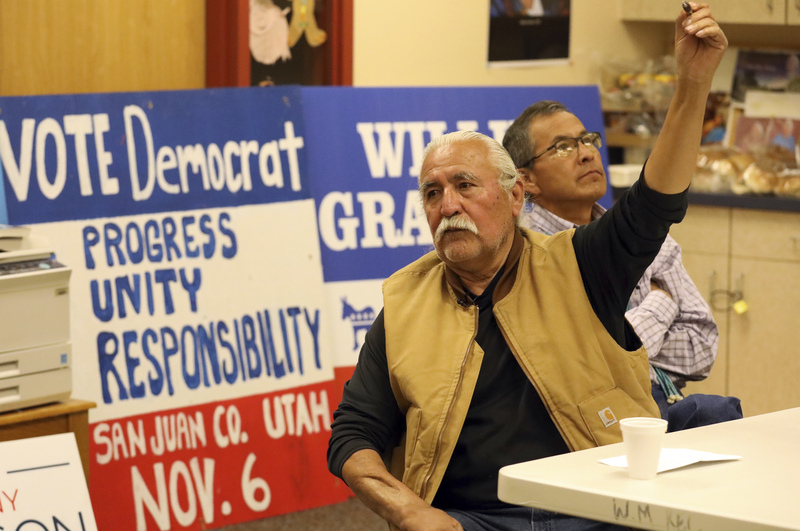 Election officials worked to address those issues, but Navajo leaders remain distrustful. Grayeyes hopes to address needs like basic utilities and neglected dirt roads that tear up buses and can wash out in storms, keeping students out of school. If he wins, the county’s governing body will be majority Navajo for the first time. Navajo Kenneth Maryboy is running unopposed for another commission seat. He believes the county could and should do more to help Native Americans. I think that the Navajos are in the right, because Utah gave them the right to vote and then took it away. Oops I forgot my punctuation!!!! I definitely agree with what you said!!!! You should definitely fact check someone before you choose to support them, because then you would not know all that you are supporting! It's not just Democrats in the wrong. Republicans make wrong choices too. I agree that it is good to fact check everything, but it's best to make sure that you are not picking and choosing facts that fit your bias. Being able to see that both parties will inevitably be wrong at some point or another leaves an open mind that is not prejudiced. You just used two democrats who lived over one hundred years ago and suggested that the democratic party hasn't changed since then? And still, you can't take two people as an example and liken the entire party to them. I could think of many horrible republicans, but I'm sure you wouldn't be happy if I based my view of the entire republican party on what a two people did. especially if they lived over one hundred years ago.